Keeping a pet rat is a responsibility that includes providing exercise as well as food, water and health care. A playpen enriches your rat's mental and emotional health, as well as her physical well-being, so you want to stimulate her mind with interactive toys and excite her curiosity with a changeable environment. Whether the pen is large enough for you to sit inside with her, or only rat-sized depends upon available space, but make the biggest pen you have room for. Use something she cannot climb over or chew through, so she can explore in safety. Cut four panels of 1/4-inch wire mesh using wire cutters or tin snips. Any convenient length is fine, but they all should be the same, to make storage easier, and a minimum of 4 feet high to prevent your rat jumping over. Place two panels together with all the edges lined up. Attach hog rings through both panels along one side edge to hinge the panels together, using hog ring pliers. For safety, file away any sharp points with a metal file. Repeat with the other two panels. Open up the two pairs of hinged panels so they lie flat, and stack one pair on top of the other. Hinge one end of the panels together as before, using hog rings along one edge. Stand all the panels up in the room where you want to use it, and arrange them to form a square. You will have one open corner at this point to use for accessing the interior for placing a rug, blankets or cardboard “flooring,” and to arrange toys. Attach double-end snap hooks to the top and bottom of the fourth corner to hold it shut while your rat is in her playpen. Undo the hooks, fold the panels together so they lie flat, and store it under a bed, or hang it out of the way on a basement or garage wall when playtime is over. Cut and assemble wire mesh panels as for the portable playpen, but set it up and fasten the fourth corner together permanently with hog rings instead of double-ended snap hooks. Cut a ¾-inch sheet of plywood to the same length measurements as the wire enclosure. For example if your panels measure 4 feet long in both directions, use a 4-by-4 foot piece of plywood. Set the wire enclosure over the piece of plywood so that the wire fits snugly over the sides of the wood for fastening. Attach the wire to the plywood every 3 or 4 inches all the way around the perimeter using a staple gun with heavy-duty staples. Cut a piece of scrap carpet or thick cardboard to fit the enclosure. This provides traction for little feet and makes accidents easier to clean up. Add an optional wire “roof” to keep your furry babies safely inside when you cannot be in the room, by cutting another piece of wire mesh and hinging it with hog rings on one side. Keep it in place using double-sided snap hooks or wire twist ties on the other three sides as needed.  Pipes with elbows and tees make ideal, easy to clean rat tunnels, but you can make do with cardboard boxes, oatmeal containers and similar throw-away objects. 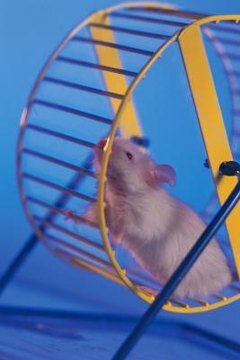 An exercise wheel is a must-have -- 11 inches in diameter is the best size for rats.  For those who prefer not to use wire for rat enclosures, these plans also will work with wood, plastic, or even cardboard panels. Simply drill or punch holes to put hog rings through, or use zip ties as fasteners. ⚠ Like all rodents, rats love to chew, and will demolish the toys available to them quickly. Use safe toys. Never put things made of toxic substances into a rat's cage. ⚠ Note: PVC is a toxic substance, but it generally is considered inert and safe once molded into it's final shape, and since it is used widely in plumbing to carry potable water, it's probably quite safe for your rat. However, metal or ceramic pipe probably is safer for your rat to play in, if you can find it in larger sizes.